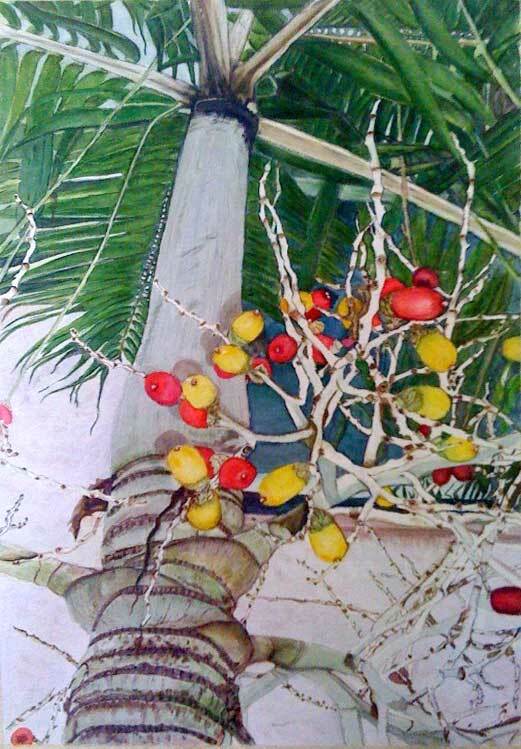 Palm Tree by Barbara Simpson, Melbourne. Barbara is one of my students and she sent this picture to me. She has been working on this piece at home. Thanks Barbara for sharing this photo! I really like the angle of the view into the tree and the colors of the berries are varied and bright compared to the cool background. 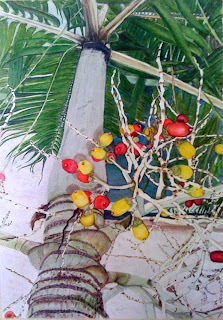 The movement of the palm fronds and the branches that hold the berries is nice also. Nice job, Barbara! I love getting photos from my students on the projects they are working on outside of class. It is wonderful to see the growth in technical handling and the fact that each person's own visual voice comes out in a unique way as they learn to control the medium. I can teach and motivate, but the students have to do the work to get to a place where they can truly express themselves!